Born into the era of intellectual and artistic reawakening, John Dee quickly rose through Elizabethan society as a scholar, philosopher, navigator, doctor, and astrologer of the Queen of England. Intrigued with so many fields, including a deep fascination with the occult, John Dee’s vast interests resulted in his unintentional creation of the largest personal library in Elizabethan England at the time, visited by renowned scholars from all over the world. Luckily for modern historians, Dee was a prolific enough writer that his life is well documented, however the question why he was tasked with so many important roles in the British court is still an incredible dilemma. Though Dee wore many hats during his lifetime, he made astounding waves in each field. He was a skilled student at St. John's College, so much so that after obtaining both a bachelor's degree and a master's from the university, Dee set his sights on working directly in the Royal Court under Queen Mary I. His relationship with the royal court, however, turned tumultuous as he became more interested in mathematics and astrology. Queen Mary I had him arrested in 1555 for "calculating", as mathematics and magic were considered close cousins in this time. The charges were of treason and he was imprisoned for a period, until finally exonerated by Bishop Edmund Bonner. Dee rose once again in the favor of the court when Elizabeth I became queen in 1558—three years after Dee's arrest. She took him on as her astrological advisor, allowing him the prestigious task of choosing the exact date of her coronation. After, he was given numerous important court duties, such as aiding in Elizabeth's exploration ambitions. Rarely discussed in references of the New World, Dee actually helped pioneer the Voyages of Exploration England took on in the sixteenth century, aiding the various ship captains in their mathematical techniques of navigation. It was he who provided the instruments used to navigate the waters, himself being somewhat of a professional in the art of navigation. Driven by a mutual desire to reestablish the great British Empire, Dee and Queen Elizabeth I worked tirelessly in the exploration of North America. By 1583, however, he had given up his work as a navigation specialist, and chose instead to focus on his research into the forces of nature and the supernatural forces of the universe. What John Dee was most known for was his work in attempting to commune with the spiritual world, particularly heavenly angels. This work was preceded by endeavors at understanding the unifying factor of nature, which he believed could be discovered through a combination of magical and mathematical means. 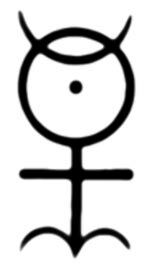 Dee wrote his first astrological book called Monas Heiroglyphica in which he discusses the various facets of the symbol he created to represent the cosmos. This text drew heavily on Christian Cabbalism, and was greatly coveted during his lifetime. However, Dee's struggle to find a prestigious patron was an uphill battle, and eventually he tired of this work on the cosmos. It is then that Dee began to focus his efforts more seriously on his angelic search, eventually joining forces with a medium called Edward Kelley , a man twenty-eight years younger than him, to conduct séances to interact with the angels. Through their continued meetings, Dee and Kelley claimed to have been given the gift of a new alphabet, said to have been revealed to them by angels. They called the language ‘Angelic’ and later it became known as ‘ Enochian’. Less than a decade after meeting, however, Kelley and Dee's interests began to drift once more. Kelley himself claimed that he was also gifted in alchemy and could turn ordinary metals into gold. As such, Kelley continued to work with Dee as his scryer, but focused much more of his time on an attempt to transform substances and find the legendary Philosopher's Stone. The seven years they spent together, leading nomadic lives and working endlessly on their newfound alphabet, came to an abrupt end in 1589, when Kelley returned to the court of the Holy Roman Emperor Rudolph II and Dee went home to England. Dee outlived his former friend by many years, and continued their work, immortalizing them both with his Angelical/Enochian literature. Over time, Dee's work in the occult became more heavily criticized and, after parting ways with Kelley in 1589, he became Warden of Christ's College in Manchester, England. He died a poor man's death in 1608, having fallen out of favor with Elizabeth I's successor James VI/I. Despite the way his life ended, John Dee was considered somewhat of a wizard in Elizabethan circles. Even with so few followers of his angelic endeavors, his work evolved into a modern magical and religious practice that continues to be utilized by occult organizations around the world. In 2016, researchers got another reminder of John Dee’s mysterious ways. 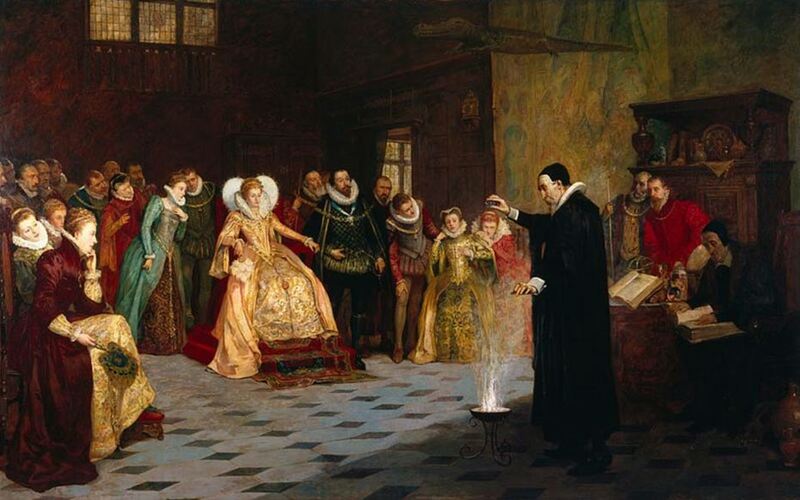 They were shocked when they discovered a hidden element through x-ray analysis of the famous painting depicting ‘ John Dee performing an experiment before Queen Elizabeth I’ (the top image in this article) . It’s been revealed that Dee was originally painted standing before the queen in a circle of skulls. "John Dee." Elizabethan Era. 2015. Accessed June 9, 2015 http://www.elizabethan-era.org.uk/john-dee.htm. The painting seen at the top of the page, depicting Dee performing a ritual or experiment before Queen Elizabeth 1st, was altered by the 19th century artist, Henry Glindoni. In the original version, Dr. Dee was shown standing in a circle of human skulls, placed on the floor. Glindoni painted them out, possibly at the request of a potential buyer. The skulls were discovered a couple of years ago when the painting was x-rayed.